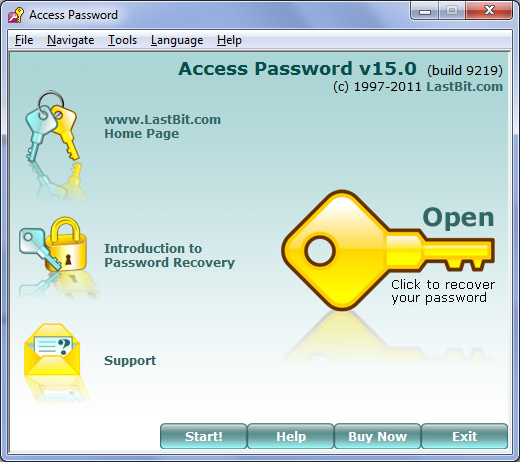 Complete password recovery solution for MS Access. Using Access Password, you can decrypt passwords for any Jet databases, not only Access databases. Access Password supports all MS Access versions from v2.0 through 2010, file types: Access 2007, 2010 : .accda, .accdb, .accdc, .accde, .accdt; Access 2003 and earlier: .mda, .mdb, .mde, .mdw. Program reveals database passwords (Access 95 -2010), user passwords (Access 95 - Access 2003). Recovery methods used by Access Password are Instant Password Extraction (all versions through Access 2003), Brute Force Attack (Access 2007, 2010), Dictionary Attack (Access 2007, 2010), Smart Force Attack (Access 2007, 2010), Password Variation (Access 2007, 2010).Program supports1) Guaranteed Access 2007 Password Recovery Service. You can reveal any password-protected Access 2007 database within 48 hours - regardless of the password length. Available for registered users.2) Office 2007/2010 Password Recovery Service - available if your install demo version of Access Password. Program multiple accelerate recovery of password to any object protected with password by minimization of passwords amount for selecting on basis of any possessed or suggested information.